A device that measures the outputting forces and torques from all three Cartesian coordinates (x, y, and z). 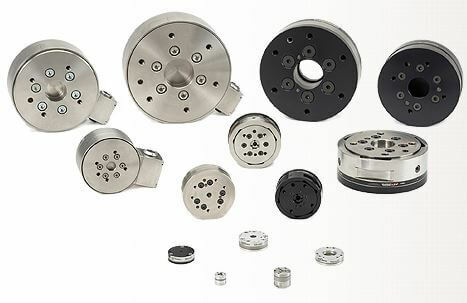 A six-axis force/torque transducer is also known as a multi-axis force/torque transducer, multi-axis load cell, F/T sensor, or six-axis load cell. Measure all six components of force and torque in a compact, rugged transducer. The ATI Multi-Axis Force/Torque Sensor system measures all six components of force and torque. The system consists of a transducer, shielded high-flex cable, and intelligent data acquisition system, Ethernet/DeviceNet interface or F/T controller. Force/Torque sensors are used throughout industry for product testing, robotic assembly, grinding and polishing. In research, our sensors are used in robotic surgery, haptics, rehabilitation, neurology and many others applications. The ATI Multi-Axis Force/Torque Sensor system measures all six components of force and torque. It consists of a transducer, interface electronics and cabling. The compact and rugged monolithic transducer uses silicon strain gages to sense forces. The transducer’s silicon strain gages provide high noise immunity and allow high overload protection, which is standard on all models. • Tool transformations translate and/or rotate the F/T reference frame. • Demo software allows configuration and basic data logging capabilities. • Biasing provides a convenient way to offset tool weight. • Threshold detection eases integration into industrial applications (Net F/T and Controller F/T only). • Integral temperature compensation insures accuracy over a wide temperature range. 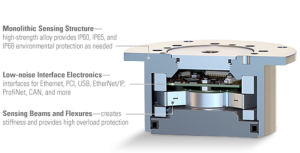 ATI also offers the Capacitive F/T, a Six-Axis Force/Torque Sensor that utilizes capacitive technology in a simple structure, providing a low-cost solution. The Capacitive F/T includes integral overload protection and is IP65-rated for protection against dust and water spray. The sensor is easily connected to computer systems using the optional USB or Ethernet conversion cables. More information here. • Overload protection: The F/T transducer is extremely rugged and durable. All transducer models can withstand high overload. • High signal-to-noise ratio: provide a signal 75 times stronger than conventional foil gages. This signal is amplified resulting in near-zero noise distortion. • Prompt delivery of standard F/T models. 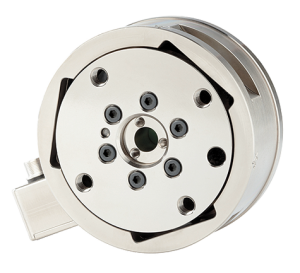 • Custom F/T transducers can be designed and built to your specifications. • Application assistance by experienced engineers.